Two very full storage units! Nick started moving boxes and lesser used items over to our first storage unit in early November. 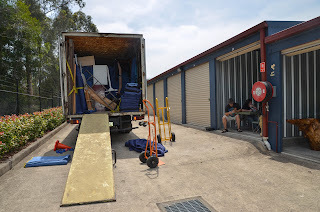 At the end of the month, we enlisted the aid of removalist to shift our furniture into a second unit (next door to the first). The same company has assisted during our previous two moves. In 2009 we needed 15 man-hours of assistance but a year later we required only 12. Another two years down the track and we had reduced even further to 8 man-hours! 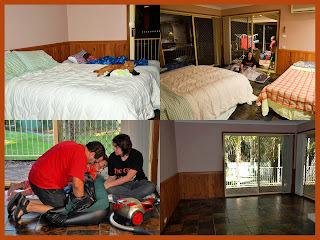 The house was a lot barer afterward and we started camping out at home. It was lucky we had our Engels and stretchers/air beds! On the last night all beds were shifted into dining room, so as to leave the bedroom carpets in pristine condition after they had been cleaned. I use the term "night" loosely. Nick and I stayed up till 2:00am and then were awake again around at 6:30am, to clear away the last of our belongings in preparation for an end-of-lease pest treatment.